It has been requested that this article be rewritten. Reason: there's flowery writing that should be removed, because it violates policy. This article is about the aliens from the Club Nintendo comics. For the aliens from the Mario Party series, see Alien (Mario Party series). 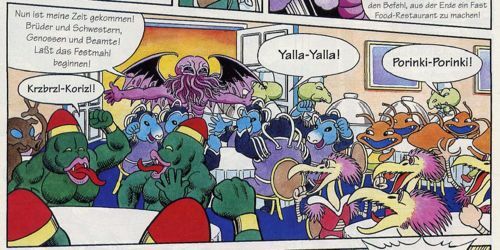 The Aliens first appeared in the Club Nintendo comic "Sag niemals Holerö". The aliens planned to turn all the humans into food with the help of the Master Alien's plans. Disguised as a human, (a famous singer named Heini), the Master Alien used a magical word in a song to turn all the humans into food. This word was "Holerö". Once the humans were food he devised a plot to get them to all come to one place; one of his "concerts". As the music became popular it was played in different places turning the people who heard it into food. For example in the comic a women decides to listen to it on a jukebox but luckily Bomberman blows it up before she can transform. After gathering the "food people" into one area the aliens would then devour them. Luckily for the people transformed into food, Mario, T.T., and Bomberman put a stop to this with the help of a magic toilet brush. Bird Alien - These aliens resemble ostriches that walk upright and have two arms. The bird aliens have purple feathers on the back of their heads and shoulders. They have a beak containing a long red tongue, and have what seems to be teeth. The rest of the their body is covered in yellow feathers with a red and yellow suit covering most of their upper body and torso. Sickobratz - They are seen in the background as waiters. Ant Alien - The ant aliens resembled large ants or cockroaches. They were relatively short; presumably under three feet. They stood up on two feet and had two arms, were brown, had antennae, and a had a large mouth baring sharp teeth.They can be seen saying "Porinki-Porinki! ", which is presumably their language. Blue Alien - The blue aliens have a hippopotamus-like appearance. The blue aliens were blue (obviously) and wore a purple and black suit that covered most of the body except for the face. Their suits had tubes coming out of the back of it, and going into the head, perhaps a breathing mechanism. They can be seen saying "Yalla-Yalla", which may be their language. Brown Alien - The brown alien has large blue eyes and a long tube like mouth, with three-fingered hands. It looked like a sort of mud-made creature of some kind. Green Alien - The green alien is a large buff alien bearing a mouth with large pink lips, many sharp teeth, and a long red tongue. The green alien also wears a dome shaped red and gold hard hat. They can be seen shouting "Krzbrzl-Korizl! ", which is probably their language. Cyclopyic Alien - The cycloptic alien has one eye (obviously). This alien is blue, and has a face with light blue facial hair: a mustache, and a beard that goes up over its head. This alien also has a large mouth with many sharp teeth and its head also has golden bolts on both sides. Iguana Alien - This alien is briefly seen and resembles an iguana with a suit on. It has spotty skin with large, curved tusks coming out of its mouth. Squid Alien - This alien resembles a blooper or just a squid like animal. This alien probably comes from an aquatic planet. The alien's face, however, resembled a fish, and also had fins on the cheeks (possibly ears) and a spiky dorsal fin going down its back. 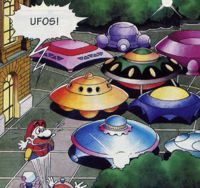 The UFOs seen in the parking lot are presumably the way the aliens came to Earth (They are probably on Earth because there are only humans and no Mushroom People where the comic takes place). UFOs are high-tech vehicles that can travel large distances in space. There are also many different kinds according to the comic, some shaped like saucers and others look like squares. One of the aliens (Heini) resembles Cthulhu. This page was last edited on January 10, 2019, at 21:02.